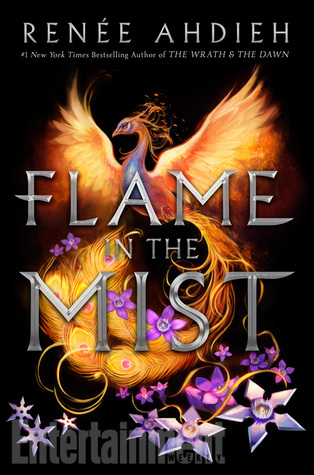 Flame in the Mist is pitched as “Mulan retelling meets 47 Ronin” and while that definitely drew me in, make no mistake: Flame in the Mist is so, so much more than that. Set in Feudal Japan (not the China of Mulan), the only big, crucial thing Flame in the Mist has in common with Mulan is a girl pretending to be a boy. Other than that, Flame in the Mist is its’ own original, delicious self. Let me start off this review by applauding the writing. If you’ve read The Wrath and The Dawn, you’re already familiar with Renee Ahdieh’s beautiful writing style, and Flame in the Mist is just as exquisitely written. The writing is detailed, poetic and lush and every scene feels so vivid it’s almost like watching a movie. Every breath-taking sight, every mouth-watering taste, every exquisite smell and every soft touch feels so real and I can only praise Renee for her gorgeous writing. This writing style really helps the world come to life. Though we don’t get every detail yet, the world still feels so real and well-developed. I’ve always had an interest in Feudal Japan, and this world feels like the perfect mix of the realistic and the magical. Because it’s not just a historical fiction, there are magical elements to this world that are slowly unveiled while still retaining a lot of mystery for book two. The cast of characters is pretty big, but each and every one of them is super intriguing and well-written. Mariko was quite an interesting character as she’s not your typical strong or skilled fighter, but she’s really smart and cunning. Her curiosity is her most defining character trait and though I didn’t always like her or her choices, I still really appreciated her as an original main character. The other members of the Black Clan are pretty important too, and though we don’t go as deep into all the characters, we do learn enough about a few of them to quickly endear them to us. And other characters, such as Kenshin (Mariko’s brother), Yumi and even the Emperor and his family are all intriguing in their own way and it’s been great getting to know each of them a bit (some even with their own POV). As I mentioned in the beginning of this review, Flame in the Mist is so much more than what you get out of the blurb or the Mulan-pitch. I can’t even go into this too much without spoiling, but let’s just say that the story is full of twists and turns and though a few tropes may be present, overall it was still highly original and unpredictable. A few scenes had me gasping out loud, because, boy, I DID NOT SEE THAT COMING! In the same vein, can I just mention that the ending is evil and the fact that the wait for book two is still about a year, is killing me? What else killed me in this book? The romance. We have a lovely enemies-to-lovers romance going on in here that is swoony and hot and the chemistry is AMAZING! The banter, the glares, the mutual respect,… Everything about this couple made me ship it, and ship it hard! The pacing is the only thing that felt a bit off to me and that’s the main reason why I didn’t give this 5 stars. I felt like this book should have been a bit longer, because certain plot points felt too rushed for me and that kind of took me out of the story. For example, Mariko’s inclusion into the Black Clan felt too quick. The building of trust in eachother, for both parties, did not take long enough for me. And I had the same problem with the romance. It wasn’t there and then suddenly it just was. This does not mean that 1) I didn’t ABSOLUTELY ADORE it and 2) I didn’t SHIP THE ROMANCE LIKE CRAZY. Yes, I wished the pacing had been better. I wish certain story arcs were given more time and had been developed just a bit better. But at the end of the day, I still enjoyed everything about this book immensely. So yes, it has issues, but also, I don’t care. It’s just that good. In conclusion, despite a few minor issues, I adored Flame in the Mist. I’d highly recommend it to anyone interested in Japanese mythology, Feudal Japan, gorgeous writing and swoon-worthy romance. “Sometimes we must fall forward to keep moving. Remain motionless—remain unyielding—and you are as good as dead. Have you read Flame in the Mist? What did you think about it? Yes, for me the pacing was definitely the one downside to an otherwise amazing book! It was a bit of a pity, but on the other hand, I still LOVED everything else about this so it did kind of make up for it 🙂 If you loved The Wrath and the Dawn, I think you could definitely love this one as well. The writing is still so gorgeous and the enemies-to-lovers trope (despite the pacing) really stole my heart <3 Hope you'll enjoy! This is a great review! I’m so interested in finally getting to it soon, though I’ve definitely heard mixed reviews. I loved her other series, so I’m going to give this a go – I’m really glad that you enjoyed it. I love books with a big cast of characters, especially if they’re all well-developed! Thanks so much! It’s definitely not a perfect book and I can understand the mixed reviews, especially where the pacing is concerned, but overall I just loved it so much that I didn’t mind those things myself. I think that if you loved her other series, you could definitely enjoy this one as well, as the writing is still so beautiful and the characters are for sure intriguing! Hope you’ll enjoy! I haven’t read this book yet; I bought it last week but was in the middle of her last book, The Rose and the Dagger. I absolutely loved her writing so will definitely be picking up this one soon. I’m very intrigued by the premise, Mulan in Feudal Japan. And I love me some hate to love romances. Everything about your review made me want to drop my current read and make a dash for this book. I’m so glad you liked it. Happy reading! Oh I think if you loved the writing in The Wrath and The Dawn, the Mulan in Feudal Japan premise and the enemies-to-lovers trope, you’ll probably love this book as well 🙂 I hope you’ll enjoy it as much as I did! I’ve read a few reviews that mention the pacing being an issue. It sounds fantastic overall though, especially the enemies to friends romance, so I definitely still want to read it. Great review! Yes, the pacing was really the only downside for me, but I really loved the rest of it so overall I didn’t really mind all that much 🙂 Hope you’ll enjoy it! It was fantastic, I really loved it 🙂 Hope you’ll enjoy it too! This book is amazing — consistently gets great reviews from all the bloggers that are reviewing it. What a gorgeous read this sounds like! It was indeed really gorgeous, or at least I really loved it 🙂 Hope you’ll enjoy it too if you decide to pick it up! Haven’t read anything from this author before but this book has been in my radar lately. I’ve read some mixed reviews too, but I love feudal japan stories, so I think I’m going to try this one soon. Great review! If you love Feudal Japan stories and if yopu don’t mind a bit of fantasy mixed in, I do still think you might really enjoy this one! It has its’ flaws, but also so many good points <3 So I hope you'll enjoy! I’m super excited to pick this one up 🙂 A Mulan retelling – wahoo! I’ve been waiting for one of these for so long! So glad that you enjoyed it! I do adore Mulan so I had to grab this one as soon as it came out 🙂 I hope you’ll enjoy this one too! Beautiful review Lindsey, and you’ve made me want to read this book even more!! (Which I didn’t think was possible, because AHHHH it just looks absolutely incredible in every way – except for the pacing). So glad you loved it 🙂 I especially like what you said about the romance; I also love it when there are enemies-to-lovers, and I ADORE gorgeous banter too. Amy @ A Magical World Of Words recently posted…#VoicesofYA Tag! I don’t know how I let this beautiful review slip under my radar Lindsey! I saw on your wrap up that you’d read it and I came searching for your review. I love how in depth you’ve gone here and I can’t disagree with any of your points. The pacing was a little off at times and I did a 4 star as well! Ahdieh delivered, but there was something about The Wrath and the Dawn that made me totally ignore my issues and 5 star it anyways – but that didn’t happen with this one. Anyways, sorry for my jumbled Monday morning comment! Ah so glad you felt the same way about this book Di! Yeah, something felt a bit off, and I think it was mostly a problem with the pacing. It should have been a bit longer and have given some more time to developing the characters and relationships.